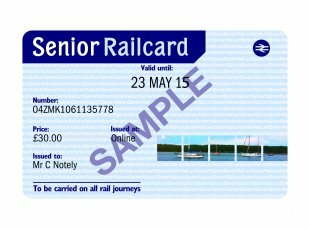 I have just become eligible for a senior railcard. This question is more in hope than expectation: can I get any discounts outside the UK? I guess that the answer is no. The FAQ page tells me that it is not valid in the Republic of Ireland or even Northern Ireland so it is not actually even a whole UK railcard. This strongly suggests but does not confirm that it has no value beyond. Addition: I ask with a little hope because some England / GB / UK cards have some value beyond their primary territory e.g. National Trust and English Heritage. Addition: Use as proof of age is not interesting as, if I am overseas, I will necessarily have something else which is likely to be accepted e.g. my passport or national ID card. Anyway, it would seem to be of no use as the card does not indicate my age. I had to provide evidence of my age to get it but nothing appears on the card itself. There is also no photo so I am not sure how an inspector would verify that it is mine. I presume that I should carry some other ID but I don't see that requirement stated. Based on experience with some other memberships, I had hoped that a few other organizations might accept it. I gave a couple of examples in my previous addition: National Trust and English Heritage cards are accepted in some places beyond their primary territory. My Oxford Union membership card allows me access to a variety of organizations around the world. No, the railcard doesn't carry any benefits outside of the UK. Yes. Your Railcard is accepted by all of the Train Companies who operate Passenger Railway Services in Great Britain, except Eurostar. Special excursions and charters are also excluded. There's no explicit statement that non-UK services aren't included (except those in Ireland), but the FAQs provide a straightforward and reasonably specific description of where the card is valid (and of the services within that region which are excluded), with no mention of any validity outside the UK. This strikes me as a case where an absence of evidence is very strong evidence of absence. If the cards were accepted by (for example) Deutsche Bahn or other foreign train service providers, this would surely be mentioned in the above FAQs. While there is no intentionally-provided value for the card outside of the UK as detailed in Chris H's answer, perhaps as a matter of fringe value the card might be deemed an acceptable form of proof of age in countries where there are senior discounts offered without the need for a special card to redeem the discount, such as Belgium.